One of my blind spots in terms of legendary directors is Ingmar Bergman. The Swedish filmmaker created more than 60 films during a career that spanned more than 50 years. Woody Allen cites him as "probably the greatest film artist". Before this viewing, I'm sad to admit that I'd seen only three other Bergman films, The Seventh Seal, Persona, and Fanny and Alexander. These are considered among his greatest pictures, along with this month's pick for the List of Shame continuing series. 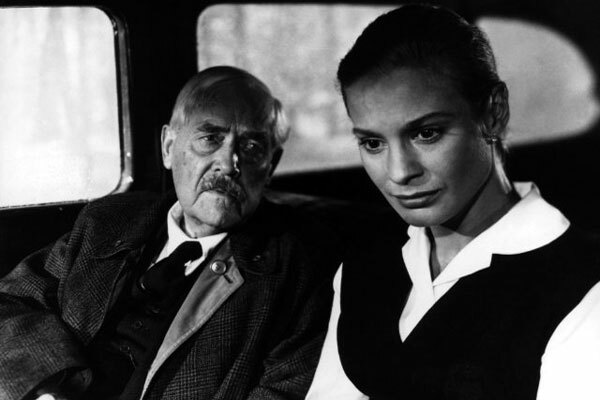 I knew little about Wild Strawberries beyond its description, which seemed to promise a dreary look at regret and death. Would it live up to these expectations? The answer lies below with my responses. Dr. Isak Borg (Victor Sjöström) is heading back to Lund University to receive an honorary degree. The 78-year-old man is a serious guy who has strained relationships with his son Evald (Gunnar Björnstrand) and his daughter-in-law Marianne (Ingrid Thulin). She joins him for the car ride back to Lund from Stockholm, and they pick up several groups of passengers along the way. During this journey, Isak reflects on his life and experiences lucid dreams about his own death and guilt about the past. He remembers key moments from his youth and realizes how difficult he's become as an old man. While reliving the past is tough, he also starts learning what it truly means to be alive. I hate to say it, but I've avoided much of Bergman's work because it seemed pretentious. This isn't a fair way to look at any filmmaker, especially when I've only seen a few movies. However, it does play a role when I'm selecting films. Another barrier was the story, which promised a depressing experience. Here's the one-line description from IMDB: "After living a life marked by coldness, an aging professor is forced to confront the emptiness of his existence." This isn't the type of choice for a rousing Friday night viewing. Right from the start, it was pretty clear that my assumptions were false. It does focus on sad topics, but the story is fascinating and full of interesting moments. 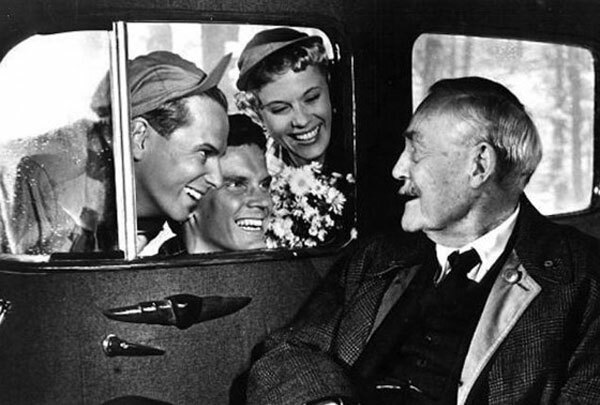 Wild Strawberries works because it's tackling universal themes of guilt, love, and fear of death. Isak is a more serious guy, but I can see a little of myself in the way he looks at the world. Another positive is the surreal tone of the dream sequences, which bring a modern feeling to the story. 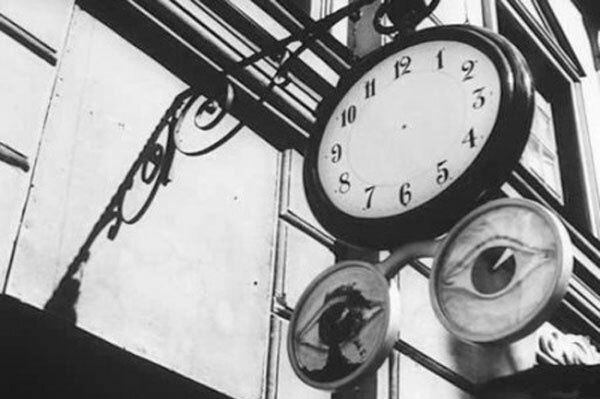 The first example is the most eerie sequence and shows Isak in a world where clocks no longer have hands. He passes a man with no face and then confronts his mortality directly by seeing his own body. Using virtually no dialogue, Bergman cleverly presents Isak's greatest fears. It's a tense and strangely quiet scene that wouldn't seem out of place in today's films. Bergman doesn't overplay the shock moments and lets them play out slowly and enhance their effect on the audience. There are a limited number of characters in this movie, and the central figures are developed well. Isak is basically a static figure, but Sjöström must use subtle changes to indicate the evolution of his worldview. This was the final performance for the long-time actor, and he never misses a beat. The final shots of his face are pitch-perfect and convey all we need to know without a single line of dialogue. The revelation here is Ingrid Thulin, who brings great depth to the difficult role of the daughter-in-law. Marianne spends much of the story holding a big secret, which helps to explain her cold behavior towards Isak at the start. Her world-weary look contrasts sharply with the energy of young Sara (Bibi Andersson), who's full of life and ready for anything. She joins their drive along with her hithchiking buddies Viktor (Björn Bjelfvenstam) and Anders (Folke Sundquist). This trio plays a key role in reminding Isak (and Marianne) about what he's been missing. The only false note comes from the brief appearance of Evald. He seems too obviously nasty and lacks the extra dimensions of the others. His thin role is likely by design from Bergman but hits the point too clearly. 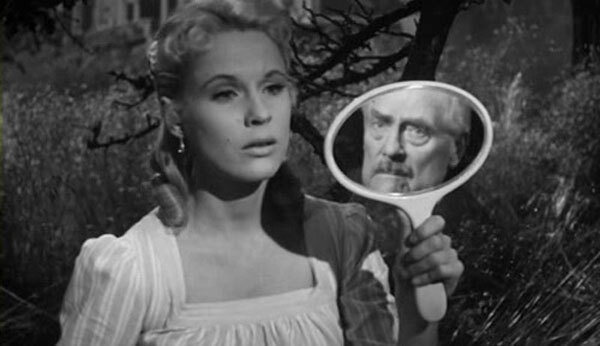 Wild Strawberries has plenty of great scenes, particularly during the dreams. Along with the opening sequence mentioned earlier, there's an intriguing examination where Isak's subconscious nags at him about his guilt. We observe a key moment where he watched his wife cheating on him and start to understand his current state. This isn't the type of guy who can move forward and forget the past. Isak may be through with the past, but the past isn't through with him. Back in reality, the final act includes heart-warming moments that feel earned. He shares a tender moment with Marianne that shows how much each has learned about the other. The hitchhikers (particularly Sara) leave on just the right note and have clearly affected him. Another interesting scene involves the arrival of a married couple who fight constantly. Their bickering seems charming at first, but it quickly devolves into something much nastier. We don't know it at the time, but the connection to the relationships of both Isak and Marianne is too much for them to take. Without hitting us over the head, Bergman makes a key point that even the most promising relationship can reach this torturous level. Although I've read plenty of great things about Wild Strawberries, it isn't the type of movie people rave about constantly. I wasn't sure what to expect, which made the experience even more rewarding. I'm not sure that I'm ready to embark on a Bergman marathon, but I would like to check out more of his films. There's so much to like with this movie and it's more accessible than his other films that I've seen. I really felt the heart in this story and enjoyed watching Isak start to fix his life. There's still a question on whether this will change him over the long term, but he's definitely on the right track to a better life. I haven't seen a single Bergman but this is definitely one of the first I am going to tackle. Glad to hear you found it rewarding and accessible! 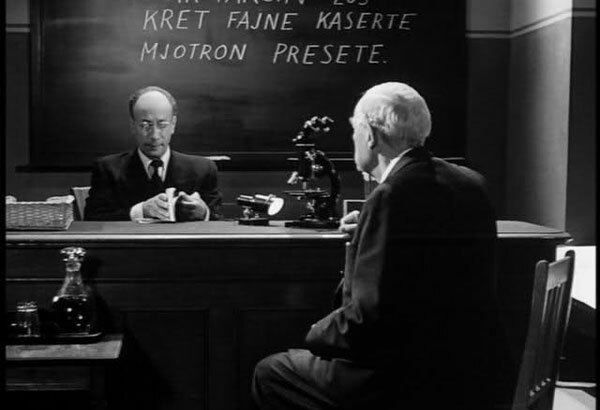 Pete, judging by the four I've seen, I think Wild Strawberries is definitely your best bet in starting with Bergman. It moves quickly and is pretty accessible compared to the others. Yes! Embrace Bergman! ONE OF US! ONE OF US! 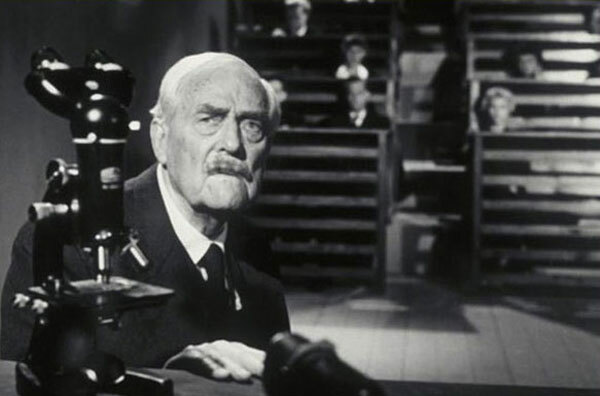 It's hard to find superlatives to describe Wild Strawberries, it's just a film that WORKS on every level. Martin, I still feel like a Bergman novice, but I can't argue with you about Wild Strawberries. When I set up the films for this monthly series, I wasn't that excited about this one. I'm happy to be proven wrong by this remarkable movie. Oh how I love WIld Strawberries, let me count the ways. 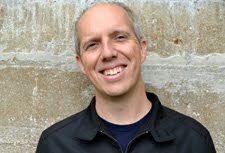 Bergman is my favorite filmmaker of all time, it isn't even close, but I think your initial concerns that you may find his work pretentious are completely valid. I too felt that way before I put on The Seventh Seal one cold, dark night, and my way of thinking was immediately reversed. His films just have this mystery and... awareness to them. They're so advanced, in my opinion. Really good review of one of his best films. Hope you'll be watching more Bergman soon! Alex, I'd like to check out more Bergman films. I was pretty hesitant to dive in, but Wild Strawberries was definitely worth my time. Where do you recommend that I watch next? I always recommend to start as far back as you can and make your way down. Wild Strawberries and The Seventh Seal are the most common starting places. So I'd start to make your way through the 60s, in order, if you can. Enjoy! Thanks for the input. It may be a little while before I get to Bergman (I tend to over commit with my movie to-do list), but I'll plan to focus on the '60s once I get there. It was First Bergman movie I saw and since then it has remained to be one of my favorites as well. After watching quite a bit of his work now, I still believe it is a great start to get to know Bergman as it is very accessible even though it does tackle heavier and philosophical themes that Bergman was known for. That's a good point about this film. It finds a way to tackle interesting concepts and big issues without feeling like it's being pretentious. Bergman keeps Isak's story on a human level and makes us care about what happens while staying intelligent at the same time. Since you mention Woody Allen at the start, and because Bergman was a huge influence on Allen's work, it's worth noting that the perfect companion piece to this film is Allen's Deconstructing Harry. In many ways, Allen's film is an homage to this one, and in some ways, a straight retelling. That's interesting, Steve. I've only seen Deconstructing Harry once, and I wasn't a big fan. I wonder how differently it would play if I looked at it as a companion piece to this movie. It's been a while since I've seen Deconstructing Harry, and I know a lot of people really like it. I just couldn't get into it, which is rare for me with Allen. This was the first Bergman film I ever saw. It didn't do a whole lot for me. I've seen a few more Bergman films since and as a whole his movies don't do much for me. I guess he's just one of those people whose work I don't connect with, for whatever reason. Chip, I'd hardly call myself a Bergman fanatic, but I will say that this movie surprised me. I can see what you mean about not connecting to his work, however. I haven't disliked any of his movies, but this is the first one that really struck me in the right way. I have just watched this film, and I wish I like it more. It's quite formal and dark, but maybe I expected it to be different. Nice write up! I went in with really low expectations, and I was really surprised by how much I liked it. Bergman has a formal style for sure; the darkness is one of my favorite aspects of the movie. Either way, I'm glad that you check it out. Thanks!